Wolf's Meadow, the main venue. Wolfsberg Meadow and Carpathian Mountains. Marius Giura is the director. 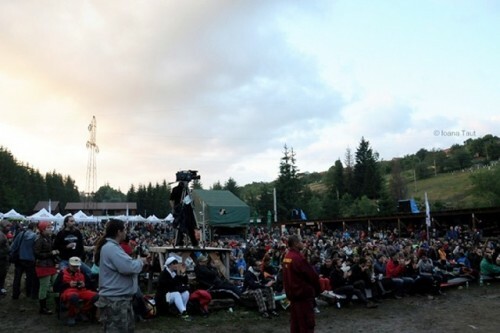 Garana Jazz Festival is the best known jazz festival in Romania and the largest outdoor jazz festival in Europe. It should be ‘Four Days of Heaven,’ since one can only hope, heaven looks a little bit like this! 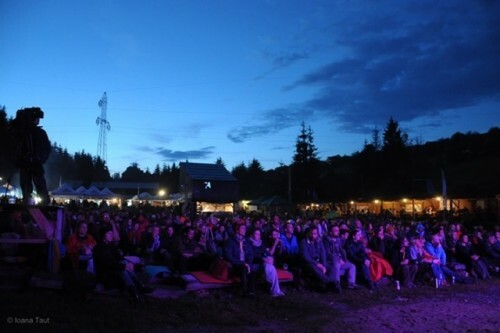 The Garana Jazz Festival is held in the Western Carpathian Mountains at an altitude of 1000 meters, right in the middle of nowhere. 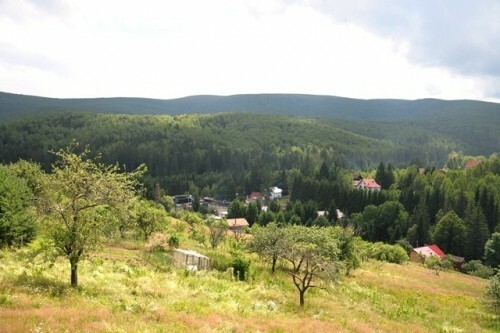 Wolf's Meadow - which is the name of the place where the concerts are taking place - is surrounded by small villages, where people have the opportunity of renting rooms for the duration of the festival. 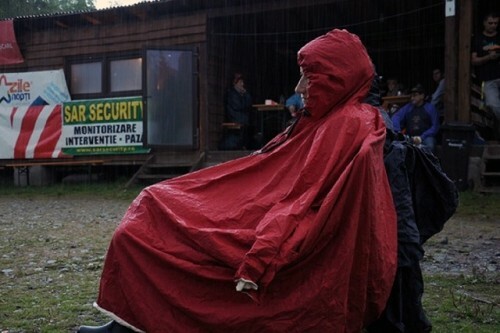 Others, willing to fully enjoy nature and wild surroundings can choose to go camping, wherever they feel like. This is how four days of summer go by almost in an instant, wrapped in the beauty of nature and joined by the sound of jazz. Sometimes, concerts can last until two or three o'clock in the morning and despite terribly low temperatures during the night, people are hanging in and really enjoying the music! Then there's the rain - that merciless rain that pours down on us every single year for one, two or as many days as it, well, rains. Ioana Taut: Mr. Giura, how do you feel now that the festival reached its 18th edition? Marius Giura: I feel the same way I felt at its 17th edition and how I will probably feel at its 19th edition as well. It’s a series of events that I make happen and probably will not stop until the time comes to hand it over. There is nothing special about this 18th year, except for the meaning of the number eighteen, which signifies a sort of maturity. Anyway, I think this festival reached its maturity a long time ago and it is still going on. IT: What makes you say that? MG: I believe that the festival started being valuable and important six, seven years ago… maybe even eight or ten years ago. I don’t remember anymore when it was exactly that big artists started stepping on the stage and the festival began to be known abroad as well and was included in the circuit of the biggest jazz festivals in Europe. IT: Tell us about the history of Garana Jazz Festival. How did it all start? MG: At its first edition, this festival was nothing but a game, a singing, a jam session between some friends, where there were only approximately fifty people. A well known Romanian drummer from Timisoara, who had settled in Germany, bought a house and land here in Garana in the beginning of the ‘90’s. He then invited another musician friend from Germany, Paul Weiner - a very important name in Romanian jazz - to spend his holidays here. Then came Liviu Butoi (a well known Romanian saxophonist), who already had a house nearby, in Brebu Nou and all together with Gigi Taus (owner of the Crossroads Inn) decided to organize some kind of jam session, which, later on, turned into a big festival. The second year was quite similar to the first one, except for the fact that it wasn’t held in a barn, but in a pavilion instead. At its third and fourth editions circa three or four hundred people came. The next two festivals were held on two real stages (a smaller and a bigger one), placed in the middle of the inn’s yard. 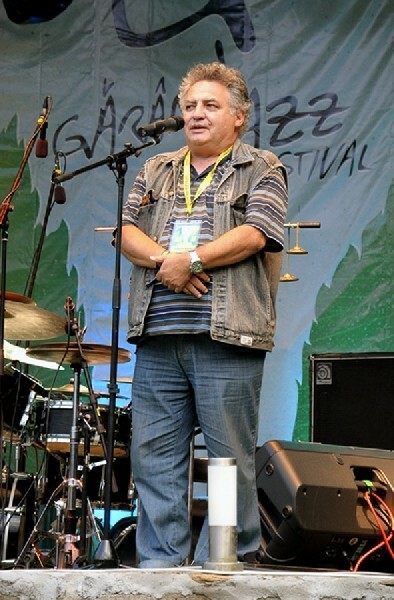 It was on the bigger stage where we had the first important artist in our line up and it was the world-wide well known jazz musician, Eberhard Weber. Then, the space was no longer big enough, since the street, the village and everything else was blocked by people. So, starting with the next year, its seventh, we decided to find another venue, which happened quickly by choosing the expansive meadow called Wolfsberg, where we’ve organized it ever since. The presence of the magnificent Eberhard Weber gave value to the festival and that’s how more and more foreign jazz artists began accepting our invitations. Slowly but surely, this festival started growing more and more each year, finally becoming what it is today. IT: I know that you are facing all kinds of difficulties every year when organizing the Garana Jazz Festival. How did it go this year in this respect? MG: It was quite hard. From the beginning I started with an idea in mind of changing the structure of the festival, by adding two other small stages: The one in the church in Valiug (another village near Garana) and the other one back in the yard of the Crossroad Inn, where it all started eighteen years ago. The line up was settled relatively fast and, as always, when you are working on it, you have no idea what kind of financial resources you will benefit from. The fundraising was a gargantuan effort. Unfortunately, even the Ministry of Culture declined its support at the last moment for reasons that I can’t quite comprehend. It’s extremely difficult to recover such a big amount in such short time notice, keeping in mind that Romania still has its financial difficulties. Then came the bad weather that scared away part of the public. All in all, it was a tough year, which I managed to bring to a good end. Also, I think that in the end, the artistic value imposed and won, because once the weather got better, plenty of other people started joining the festival. IT: Looking back, can you choose one favorite edition? MG: It’s hard to choose between them. There are three or four that, I believe, were equally valuable, but they are all close to my heart and I cannot name one that I disliked. I could try and name the year with Jan Garbarek, the edition with Yellow Jackets and Mike Stern, last year, this year’s edition… I’ve wasted a little bit of myself in each of it and it’s hard to say that I like one more than the other. IT: Could you make a top five of the favorite artists that you brought to Garana Jazz Festival so far? MG: Hmmm… that’s also quite hard, although the first place is, clearly, occupied by Jan Garbarek and his fabulous concert a few years ago. Another concert that I liked very much was Dave Holland's. I nostalgically remember Stanley Jordan’s concert… There were more concerts, it’s very hard to name which was best, considering how many big jazz artists were here, all chosen according to my own musical taste. Well, I tried to make a top three at least… (said, while smiling). IT: Which are the artists that you intended to bring to Garana Jazz Festival, but didn’t manage to do so far? MG: As any jazz enthusiast, connoisseur and lover I would have wished for Keith Jarret, but this will probably never happen. For some years, I tried to bring Marcus Miller; I tried to bring Jeff Beck also and I tried to bring Joni Mitchell, but, unfortunately, she can no longer travel. Five or six years ago I would have liked to bring Little Jimmy Scott. Unfortunately, we find ourselves quite often running against the clock with Europe, not to mention the USA. Sometimes, some artist's age or the fact that he is not touring during summer makes it impossible to bring him to the Garana Jazz Festival. Some died meanwhile, others are no longer able to play. I would have loved to bring Eberhard Weber again, because it all started when he was here for the first time. Sadly, he is no longer able to play because of a stroke that he had in the past. For instance, the Jan Garbarek concert happened because of him. He mediated Garbarek's concert, who didn't want to return to Romania after an unpleasant experience here twenty-five years ago. He came in the end, thanks to Eberhard Weber. Actually, I realized that this became a trend in the last five or six years, namely, that artists who have been to Garana in the first place, end up having a free ride for further concerts in Bucharest and that makes me feel like a pioneer. Artists, who have been to Garana start being seen as a guaranteed success in Bucharest, and this is what’s actually happening, such as Avishai Cohen, Hiromi Uehara, Nils Petter Molvaer and others. IT: What do you wish to change in the future? MG: I wish for Romania to change and I wish for the ways we approach culture to change! It's unacceptable for an authority that should be responsible for cultural matters, to actually mock culture like that. Not to fund one single cultural event in one year, that's absolutely incredible! No normal human being can find an explanation for such a thing! If things would run their normal course, if one would have support and assistance in organizing such a world class jazz festival like this one. 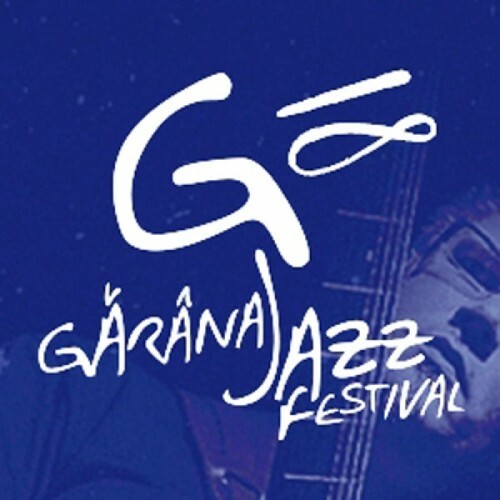 I am saying this without any lack of modesty, because that's what it is: Garana Jazz Festival is a world class festival, appreciated throughout and is a member of the Europe Jazz Network, which is the most important Professional Association in Europe. Garana Jazz belongs to the circuit among festivals like Montreux, Umbria, Istanbul, Copenhagen and others. World's biggest artists are splitting between these festivals. Everywhere you go, they have funds of hundreds of thousands of Euros. For us it's more like…try to make it if you can…. MG: That is a whole different discussion about how I can make it in the end. IT: Certainly, but still, in the end, you can do it! MG: Maybe that's the result of my own stubbornness and faith that this project is worth carrying on. Don't believe that it didn't cross my mind many times to stop organizing this festival due to all these difficulties. MG: Well, I thought that quitting now would only mean mocking all these years of hard work. I also thought of all those people who are devoted to this festival and how frustrated they would be and how much they would miss it. Truth be told - I don't think there is anybody else able to fight the battle of carrying this festival that is so anachronistic for Romania. P.S. : Arthouse Wolfsberg – one of several cultural institutions that have settled in Garana in the last 20 years – was founded by Elisabeth and Hartwig Ochsenfeld. The couple invites yearly international artists to participate in a symposium, where a group of painters and other artists work and live together for approximately two weeks. 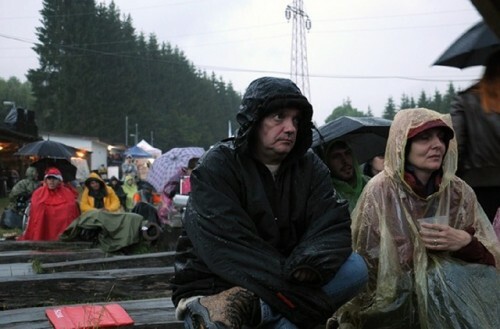 This happens generally during the time of the Garana Jazz Festival. An exhibition introduces new works to the general public at the end of the retreat. Then, some individual art works remain in Garana, building a collection for a future art museum. The publisher of Berkshire Fine Arts, writer and photographer, Charles Giuliano, showed in 2011 a series of ‘Jazz Greats’ photographs at Arthouse Wolfsberg during Garana Jazz. Here is a direct link to the digital photo exhibit on BFA.